Jul/Aug 2015: Should This Marriage Be Saved? By William Doherty • When it comes to helping couples considering divorce, therapists have a hundred ways to ask “What’s right for you?” but often find themselves tongue-tied when it comes to asking “What’s right for the others in your life?” Is it possible to talk about interpersonal responsibility without shaming clients and driving them away? By Terry Real • We spend countless hours focused on how best to keep couples together, but rarely pay much attention to how to best help them split up. And we spend even less time examining how our own emotional reactions can influence their decision about whether to divorce. By Tammy Nelson • In today’s changing world, therapists need a new road map for helping couples end unions with their dignity intact, their sanity whole, and in a greater spirit of cooperation and good will. By David Treadway • A therapist discovers what it means to be fully present, even in the face of the terrifying prospect of a declining mind. 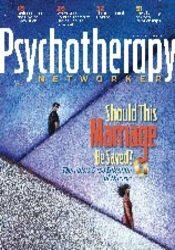 Discuss the concept of the “marriage friendly” therapist according to Doherty. Explain Real’s concepts of love dependent and love avoidant and how they may play out in a couple’s marital troubles. Describe Nelson’s three phases of an Intentional Divorce. Financial: Terry Real is in private practice. He receives a speaking honorarium from PESI, Inc. Non-financial: Terry Real has no relevant non-financial relationship to disclose. Rick Miller, LICSW, is a clinical social worker in private practice in Boston and on Cape Cod, Massachusetts with over 30 years of experience. His first book, Unwrapped: Integrative Therapy with Gay Men, was published in 2014, and he was a contributing author to the book For Couples: Ten Commandments for Every Aspect of Your Relationship Journey (2011). Mr. Miller’s popular blog, Unwrapped: Mind-Body Wisdom and the Modern Gay Man, is featured on PsychologyToday.com, and his work has appeared in Psychotherapy Networker as well as Somatic Psychotherapy Today. Diane Cole is the author of the memoir, "After Great Pain: A New Life Emerges" and writes for The Wall Street Journal and many other publications. Mary Pipher, Ph.D., is the author of 10 books, including her latest, Women Rowing North: Navigating the Developmental Challenges of Aging.